There’s so much to do in Rome, Italy’s massive capital city, that it might be hard to know where to start. I hope this travel guide helps you plan your trip! Mike and I celebrated part of our five-year wedding anniversary in Rome and while eating our way through the city was high priority (see my blog post: 10 Foods to Eat in Rome, Italy) you also need to do things in between your meals (lol), so below is just a bit of the sightseeing and adventures Mike and I were able to squeeze into a few days in Rome. P.S. My overarching tip for visiting any of Rome’s famous landmarks is to try and go early in the morning before the line-ups (and the heat) get too intense! 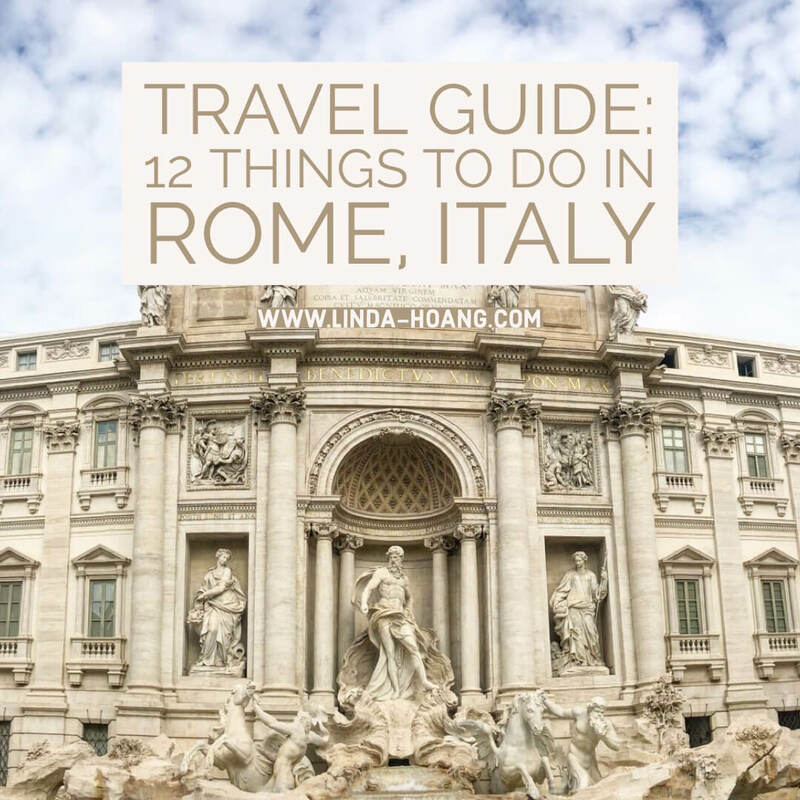 Pin + share my blog: 12 Things To Do in Rome, Italy! The Trevi Fountain was my favourite of the impressive Roman structure stops. 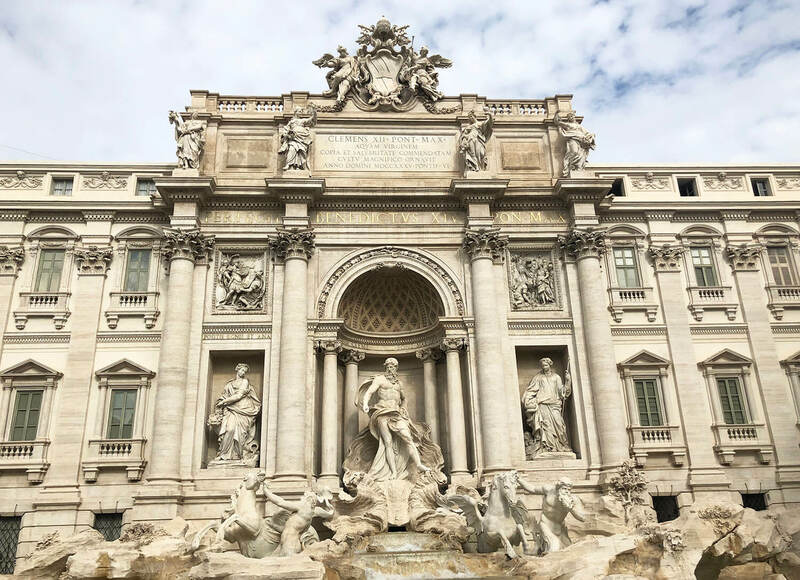 One of Rome’s many massive structures you must visit is the Trevi Fountain, one of the most famous fountains in the world. The Trevi Fountain is stunning! An estimated 3,000 euros ($4,500 CAD) in coins is tossed in each day by tourists. (Apparently the money is collected and used to help Rome’s less fortunate). When we arrived early to visit one day (before 9 a.m.), the square was almost empty which would have been lovely for photos, except that cleaners were actually sucking out the coins at the time, so the fountain wasn’t running and the central photo spot was taped off. We went back the next day (at a later time) and the square and the fountain was packed with people. This made it very lively and bustling, but hard to get a clean shot of you + the fountain. As they do in the movies, Mike and I each tossed a coin into the Trevi Fountain. According to legend, if you do this, you’re ensured a return to Rome. (And you’re supposed to use your right hand and toss over your left shoulder, based on a 1954 movie Three Coins in the Fountain). The Trevi Fountain was one of my favourite of the impressive Roman structures to visit! Something about the water flowing that made me feel quite calm despite how crowded the area was. Photo shoots at The Vatican. Mike and I get quite a kick from memories of our Vatican visit. When we walked into St. Peter’s Square (after some pretty serious security), there were just thousands and thousands of people. We’re certain it was in the thousands. We couldn’t understand why it was so busy—were Italians very religious? Oh, well it is a Sunday. I guess Sundays at the Vatican are just really crazy. Wait, why are there so many news cameras? lol. 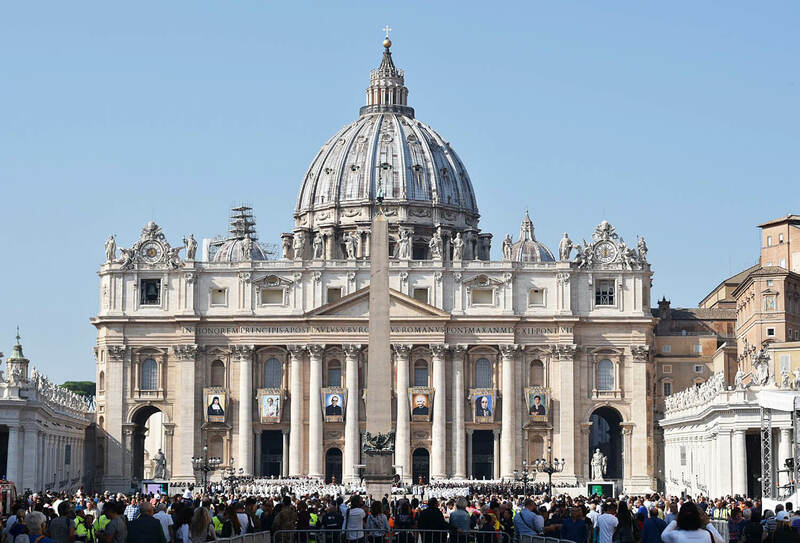 A Google search finally revealed that on the day we visited the Vatican / St. Peter’s Basilica, the Pope was naming seven new Saints! The thousands and thousands of people + news cameras suddenly made sense. The Vatican is a spot we opted not to tour the insides for, but just walking around and snapping some photos from the outside of St. Peter’s Basilica was quite nice. 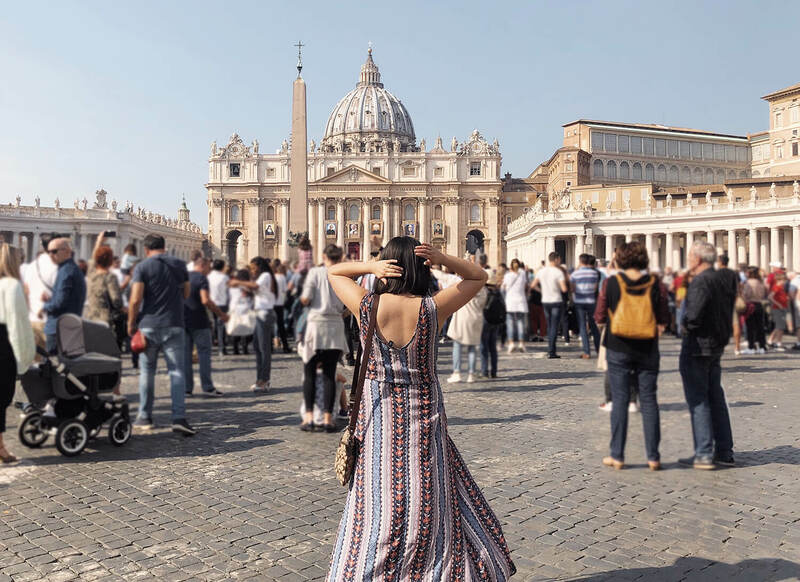 If you are religious or have an interest in that, there’s no question the Vatican is one of the most sacred and holy places in the world and one that you’ve got to see for yourself (we wondered if we would have been more in-awe if we were religious). St. Peter’s Basilica at The Vatican. Vatican City is both the smallest country in the world and the smallest city. It’s nestled right inside Rome and we actually stayed just a few blocks from St. Peter’s Basilica. It’s a good location—in walking distance to several of the other landmarks mentioned in this post. No crowds first thing in the morning at the Spanish Steps in Rome, Italy! In walking distance from the Vatican is the Spanish Steps. I remember Mike asking “why are we going to Spanish Steps when we’re in Italy?” when I told him one of our first destinations during our visit to Rome. 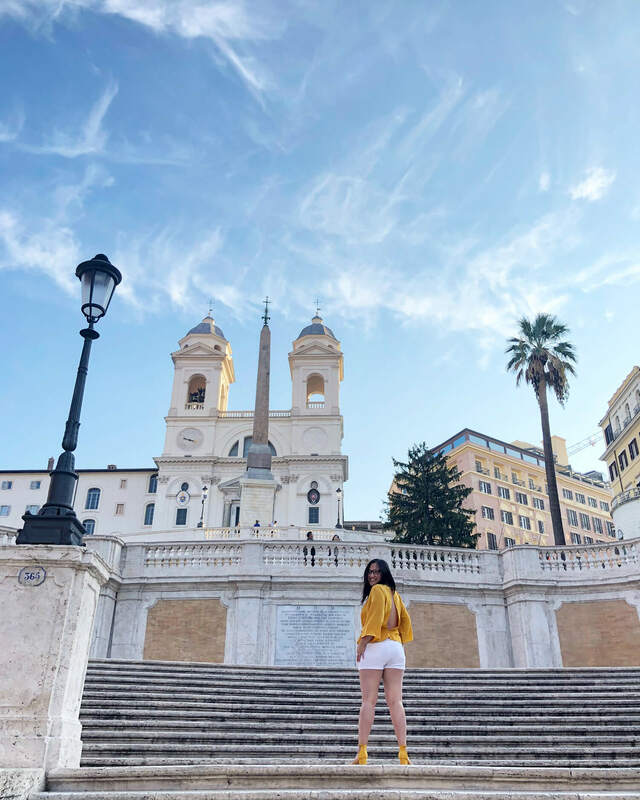 The Spanish Steps (also known as the Trinità dei Monti) and the square at its base Piazza di Spagna is one of the most visited public squares in Rome. There are 135 steps that were built in the 1700s (!!! so old !!!) and along with the Trinità dei Monti church at the top, was created in an area of the city that had both French and Spanish inhabitants. It’s like we were the only ones at the Spanish Steps! There are many areas of the steps that make for awesome photos and as mentioned, if you go first thing in the morning (we were there around 9 a.m. in October), there’s hardly anyone there. You have most of the steps to yourself—save for a few gypsies hoping you give them some money. The steps and the square at its base is a popular hang out space in Rome, perfect for people watching. The Pantheon was one of Mike’s favourite ancient structures we visited in Rome! 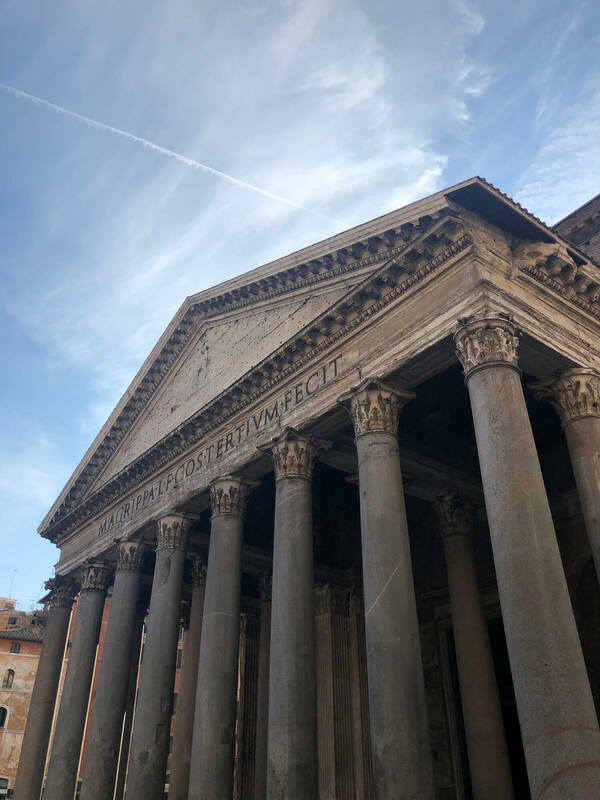 The Pantheon was one of Mike’s favourite ancient structures we visited and also one of the very few ancient structures that allow you to go inside for free! If you thought the Spanish Steps being built in the 1700s was old, this will blow you away: the Pantheon was built in 126AD!!! Incredible. The Pantheon was a temple dedicated to the Gods and is said to be one of the best preserved buildings from ancient Rome. Today it functions as a church! The very tall building contains the tombs of different Italian kings and inside there is a giant dome with a hole on top known as the Eye of the Pantheon. Another fun fact about the Pantheon is that the distance from the floor to the top of the dome is the same as the diameter of the dome. There’s also a part of the floor that takes in rain that gets through the hole. Seriously, look how big this Pantheon pillar is. When we went to the Pantheon there was hardly any line-up! This is one ancient Roman structure that will make you feel teeny tiny. 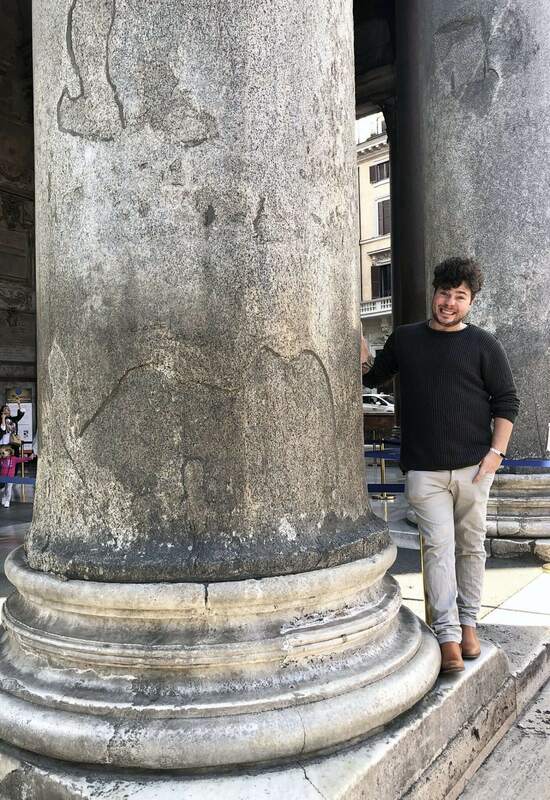 We have a photo of Mike posing with one of the exterior pillars and it’s just unbelievable how tiny he is in comparison. Ancient aquaducts means there are thousands of nasone fountains all over Rome spouting fresh, public, drinkable water! As Mike and I walked all over Rome, we began to notice all of these really interesting, old looking fountains spouting water. At an intersection, we saw people filling their water bottles from the fountain. At a park, we saw someone scoop the water with their hands! These fountains are called nasone or fontanella, “large nose” drinking fountains from the 1800s. 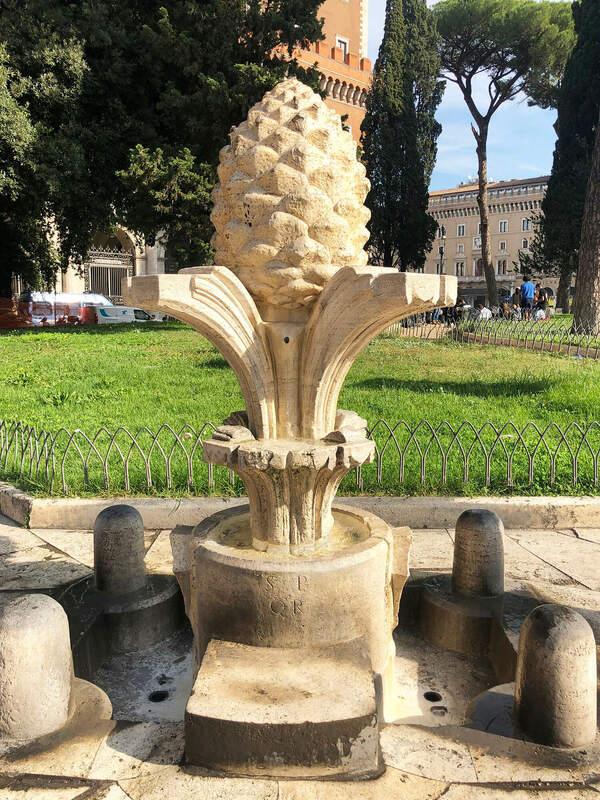 There are thousands (over 2,000) of these really unique looking fountains in Rome that offer free, public drinking water to locals and tourists alike. Another very interesting looking nasone public water fountain in Rome! This is a pro-tip for exploring Rome. If you’ve got a water bottle with you, you’re sure to come across these fountains for free water! This water is cold and definitely helps you beat the heat. It goes into the fountains by an centuries-old aquaduct. 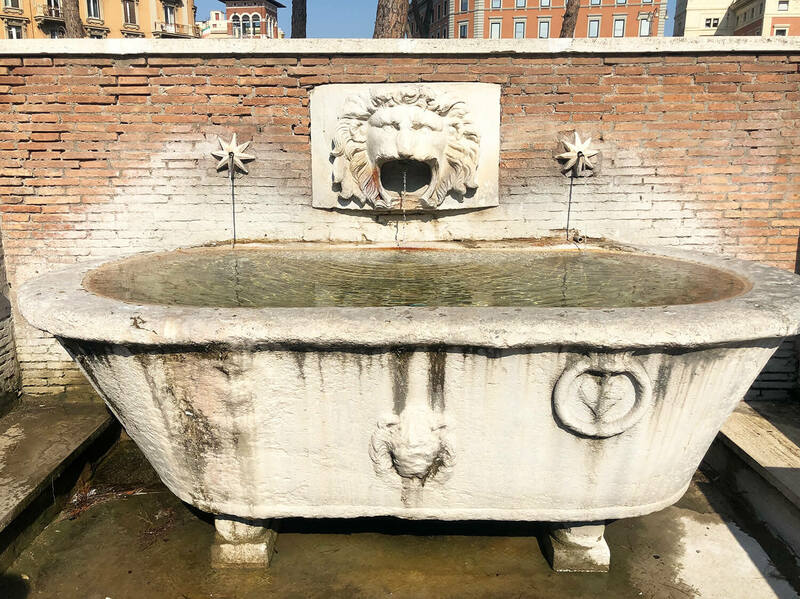 We learned that Rome has a nickname “La Regina dell’Aqua” which translates to The Queen of Water because of all the fresh, clean water that flows through these fountains. Some of the fountains spout water into tubs though we wouldn’t recommend drinking from the tub (saw some birds hanging out in there lol) but definitely from the spout is totally drinkable. Neat, hey! 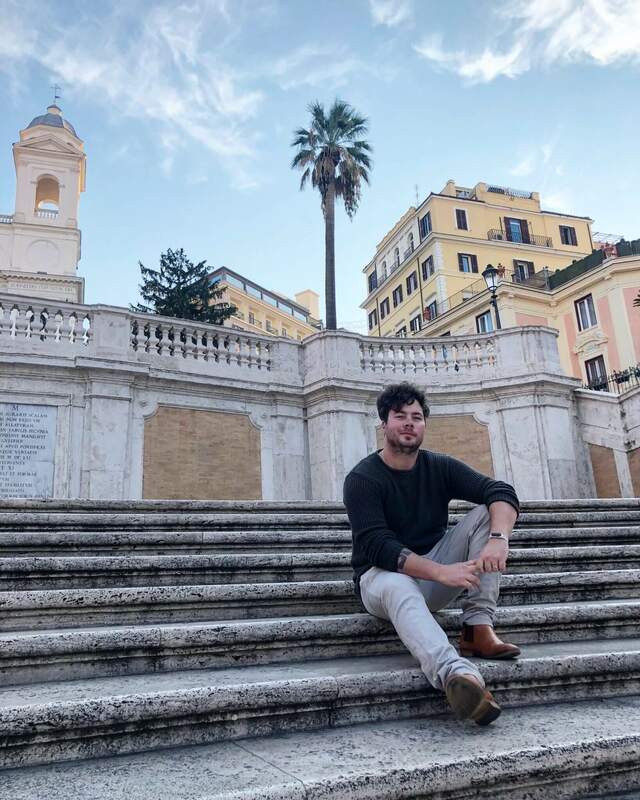 Find Instagrammable Walls of Rome! This one is by artist BLU, found in the Ostiense neighbourhood. 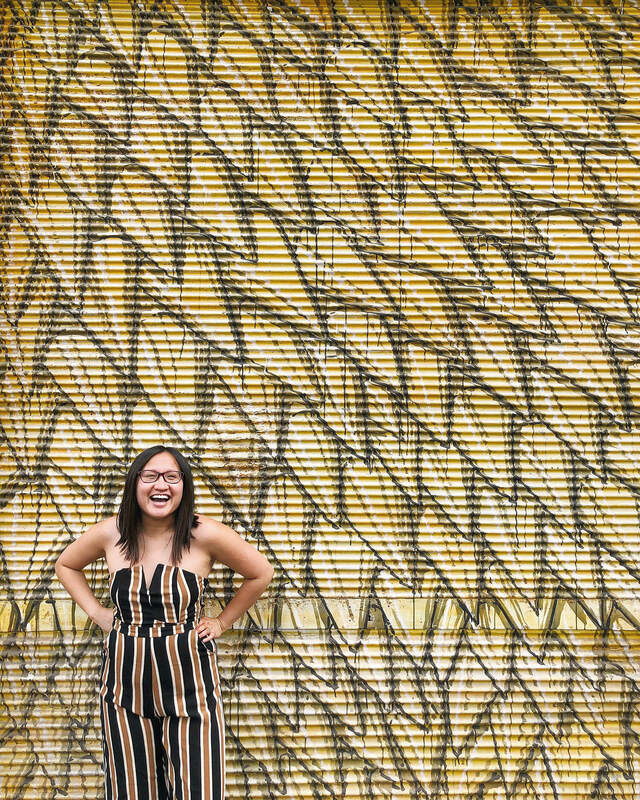 If you know me, you know I look for Instagrammable Walls wherever I go! These walls can be murals, but they can also just be colourful walls, or interesting-textured walls. I was actually surprised I didn’t find too many Instagrammable “Walls” of Rome, but I think that’s because there were just way more Instagrammable Ancient Ruins of Rome (that makes up for the lack of nice walls lol). The famous work of Italian artist BLU at Porto Fluviale in Ostiense, Rome. Where we found probably the most Instagrammable Walls + murals in Rome is when Mike and I visited the Ostiense neighbourhood. 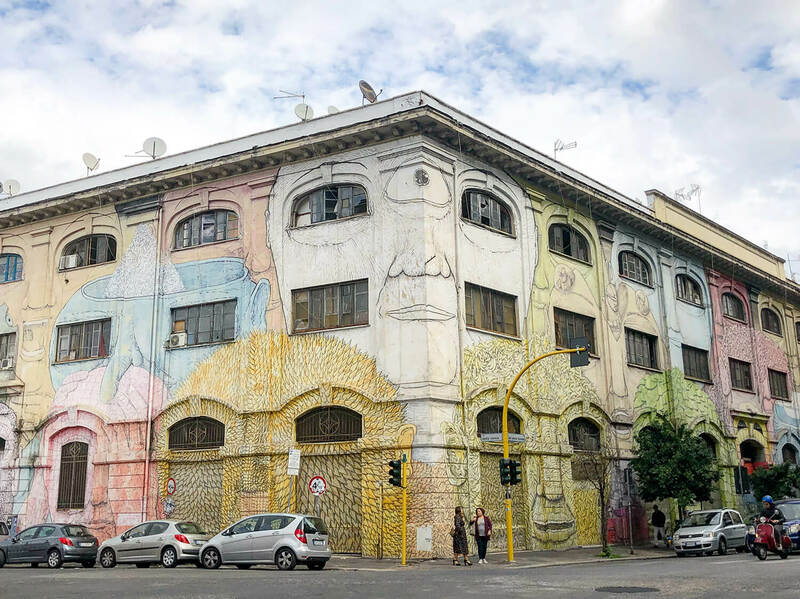 Ostiense is said to be one of the artsiest neighbourhoods in Rome. There’s lots of different street art / graffiti on these walls (some better than others) including the above iconic piece by a famous Italian artist named BLU. The building features various, colourful monsters. Each monster is said to represent issues like pollution, war, housing, and politics. There’s a list of BLU’s other great works in Rome on this website! The epic, ancient Colosseum is a must-visit on your trip to Rome, Italy. There are several tours you can do to go inside the Colosseum, either pre-booked online or right on site, however Mike and I opted not to go in (eep the line-up looked so long! We didn’t get there early enough). We got lots of lovely photos of the Colosseum exterior though, and walked all around it as well for different views—all stunning. If you’re visiting Rome for the first time, there’s no question, a visit to the ancient Colosseum, said to be built in 70AD, MUST be on your itinerary! There are SO many cats at the Torre Argentina Cat Sanctuary right in Rome! I surprised Mike during one of our walks in Rome by taking him to the Torre Argentina Cat Sanctuary—an open-air cat sanctuary/rescue located right in the city! This is a cat sanctuary built around ancient Roman ruins—ruins that are apparently the site of where Julius Caesar was stabbed by his rival Brutus back in 44 BC! What!! So interesting. Torre Argentina is home to over 100 cats. The sanctuary is run by volunteers who feed, clean and watch after the cats. You can also adopt these cats—typical adoption but also something called distant adoption, for cats that are most feral, shy, has health issues or not likely to leave the ruins you can still donate to ‘sponsor’ these cats. 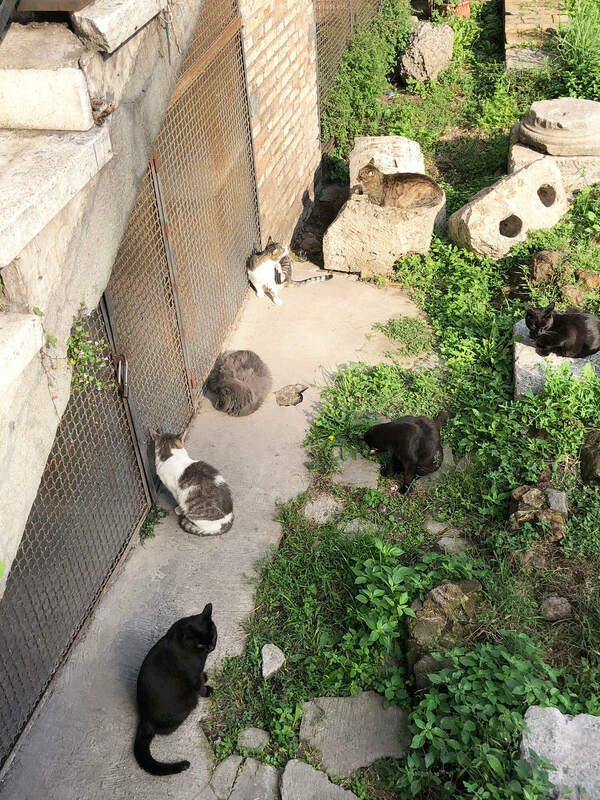 As you walk through Rome, you’ll just come across this open-air cat sanctuary built on ancient ruins! The actual adoption/office was closed during our visit so we spent some time just peeking over the rails trying to find all the cats. There were so many! And some of them in the most interesting, ancient ruin-y spots. Learn more about these Roman Cats and this neat sanctuary. Walking through the beautiful Parco Adriano near Castel Sant’Angelo in Rome. Not far from The Vatican is a beautiful park called Parco Adriano. It’s right by the Tiber River, and circles the Castel Sant’Angelo—another ancient Roman building built in 123AD as a tomb for the emperor at the time. This building has been a lot of things since then (even a prison!) and is now a museum. There are the most interesting, tall, wispy looking trees in the park, and this is also where Mike and I saw our first nasone fountain! Looking out onto the Tiber River near Castel Sant’Angelo at Parco Adriano near the Vatican. There are people fishing in the Tiber River, lots of people taking photos on the bridge leading to the castle, and of course, tons of people visiting the castle/museum itself. 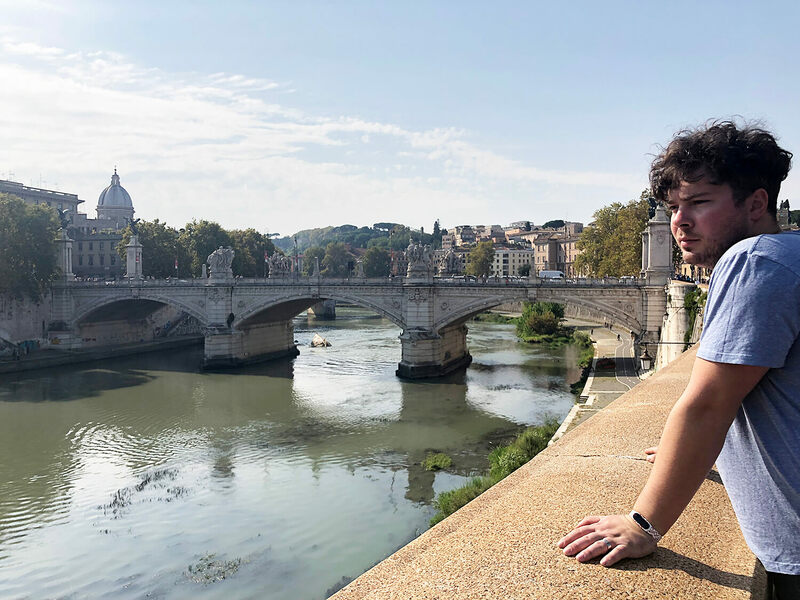 The bridge and Castel Sant’Angelo is also depicted in an Italian music video Mike and I kept seeing when we were in Rome: Fotografia by Carl Brave ft. Francesca Michielin & Fabri Fibra. Trastavere has got to be the most loveliest neighbourhood in Rome, Italy! 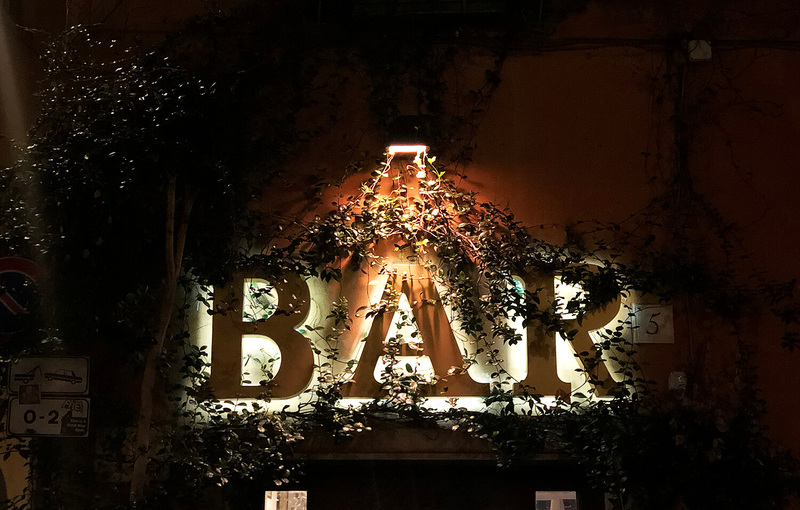 One of the very last things we did in Rome was spend an evening exploring the Trastavere neighbourhood of Rome, quite possibly my favourite neighbourhood in the city. Mike and I agreed if we were to return to Rome, we would want to stay in Trastavere. It just had such an incredible vibe. The cobblestone streets. The vines all over the old buildings. Twinkly lights. Each narrow street lined with restaurants, bars, and cafes. At night, the Piazza di Santa Maria was just *packed* with people—not in an overwhelmingly way, but in just a lovely, lively way. Patios were full. The streets felt alive and the area so vibrant. 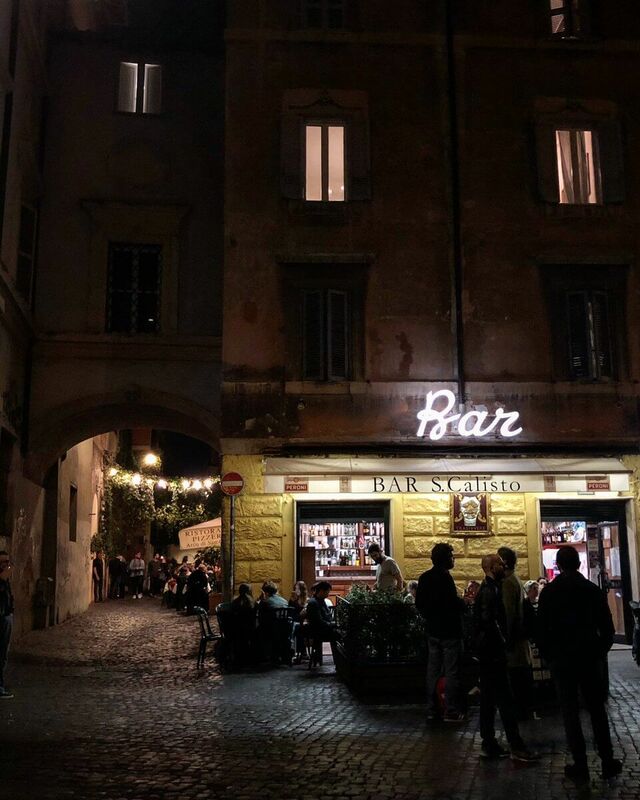 There is no shortage of bars and restaurants in Trastavere—home to amazing nightlife! 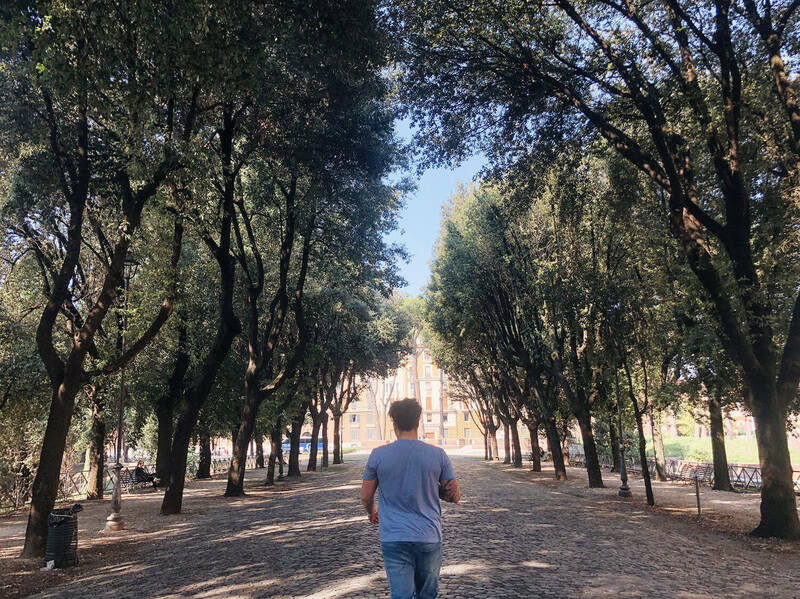 Trastavere is definitely an easy place to spend a lot of time and I wish we had spent more time in this lovely neighbourhood but I was so happy with the time we did spend there. We made our own little food and drink crawl! Mike and I went to four different places, trying bruschetta, Delirium beer, the cheapest gelato we had tried the entire Italy trip, and some really delicious pasta. The Internet will tell you that Trastavere is Rome’s best neighbourhood and we wholeheartedly agree! The Monumento Nazionale a Vittorio Emanuele II outside the Complesso del Vittoriano exhibition space in Rome. 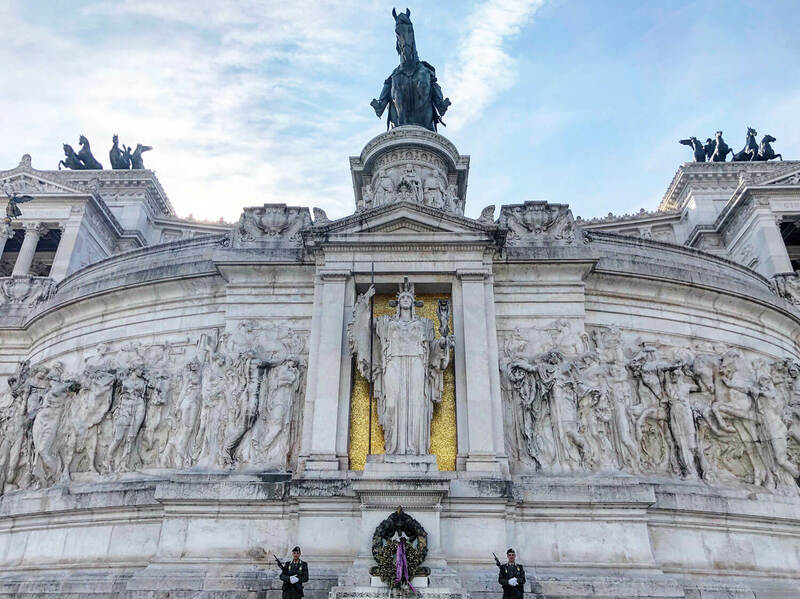 The Monumento Nazionale a Vittorio Emanuele II is a truly stunning building and opens up onto Piazza Venezia, a busy piazza in the heart of Italy. There are also some smaller fountains with incredible detail located below the main monument which make for some nice fountain photos that are less crowded than that of the Trevi Fountain. This is another building you could enter but we opted just to admire / photograph from the outside. Unlike the Spanish Steps, there is security at this monument who watch to make sure you’re not sitting on the steps or hanging out too long. Surprise! There’s a pyramid right in the heart of Rome, Italy! The 12th thing I’d recommend you do when in Rome is… visit a pyramid?! That’s right! 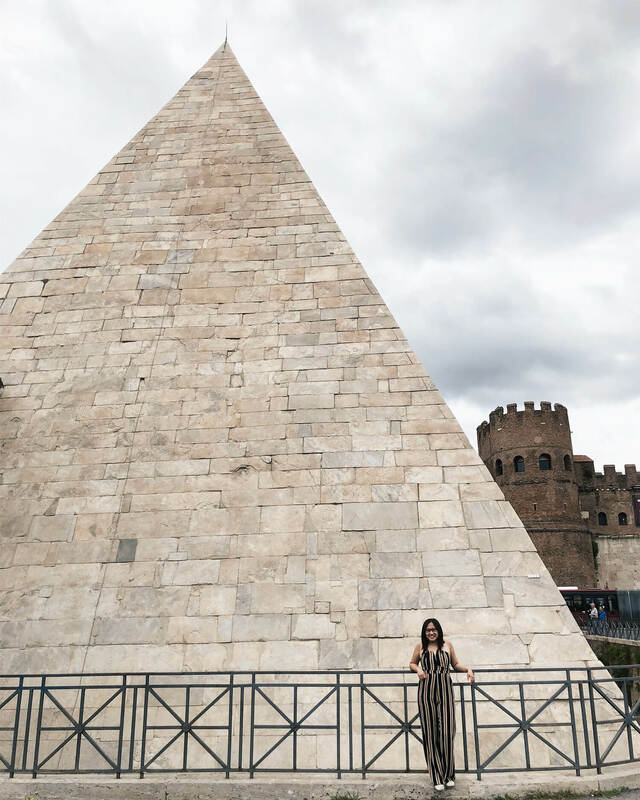 It might surprise you to learn that there’s actually a pyramid located right in the middle of Rome (in the Ostiense neighbourhood!) This pyramid is ancient too (of course), built in 12 BC as a tomb. The pyramid stands about 36 meters tall and includes a burial chamber like its Egyptian pyramid counterparts. It is one of the best-preserved ancient buildings in Rome and is said to have been located in the countryside when it was first built but now is surrounded by city/streets/buildings. In fact, now it is surrounded by a very busy street! While Rome has so many unique and interesting buildings, this pyramid is really not a building you’d expect to see in Italy but there it is! Plan to visit the pyramid on the same day you hunt for Instagrammable Walls in Ostiense! BONUS (but obviously) ONE LAST THING TO DO IN ROME: Eat as the Romans Do! Eat as the Romans do! This is an obvious thing to do in Rome, but listed as a ‘bonus’ because I’ve already got a blog post dedicated to 10 Foods You’ve Got To Eat in Rome, Italy! 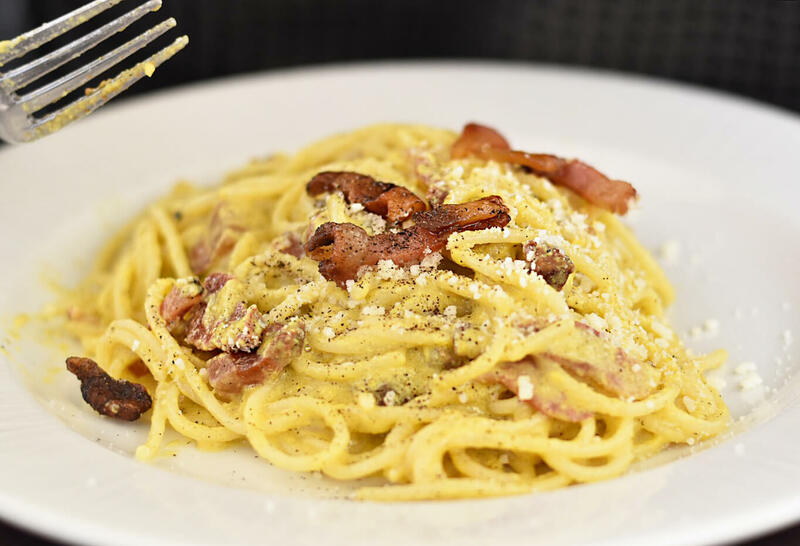 There’s lots of foods unique to or originating from Rome, like cacio e pepe, spaghetti alla carbonara and bucatini all’amatriciana pastas, and fried artichokes (carciofi alla guidia), to name just a few. Our approach to exploring Rome was basically visit an ancient structure – eat – visit another ancient structure – eat. And so on and so on. AND ANOTHER BONUS: TAKE THE TRAIN FOR DAY TRIPS OUTSIDE OF ROME! We didn’t do this because we only had a few days in Rome before our cruise, but I had looked into taking some trains to little towns near Rome too. We did end up visiting smaller towns in Italy later on our trip and really enjoyed how much calmer and quieter the towns were compared to busy and bustling Rome (though I still love the busy/bustle of a large city!) The train system in Italy is stellar so you can really go anywhere from Rome using it, if you’re not going a cruise while visiting Rome then I would highly recommend planning out a few day trips or overnight trips travelled via train with Rome as your centre. So that’s some of the bigger things we did / places we visited while exploring Rome, Italy for the very first time! 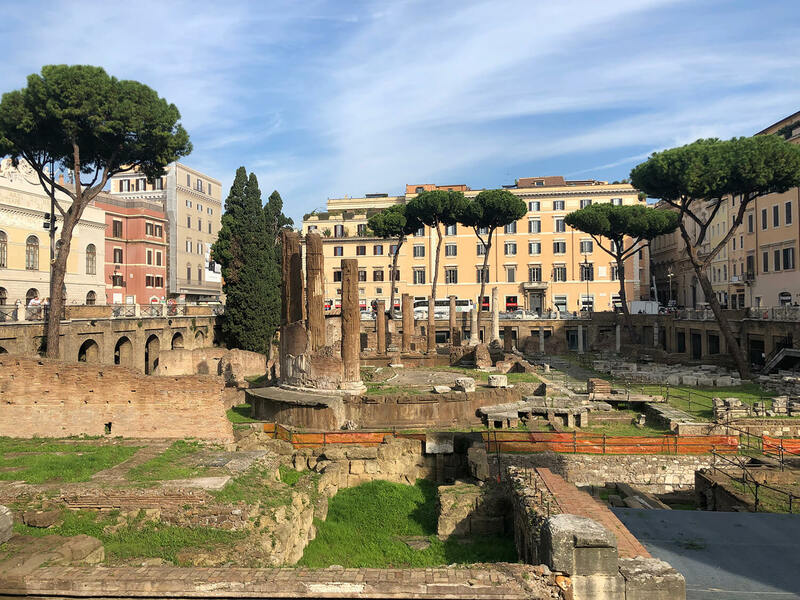 We had about 3.5 days in Rome before heading off on our Western Mediterranean Cruise. 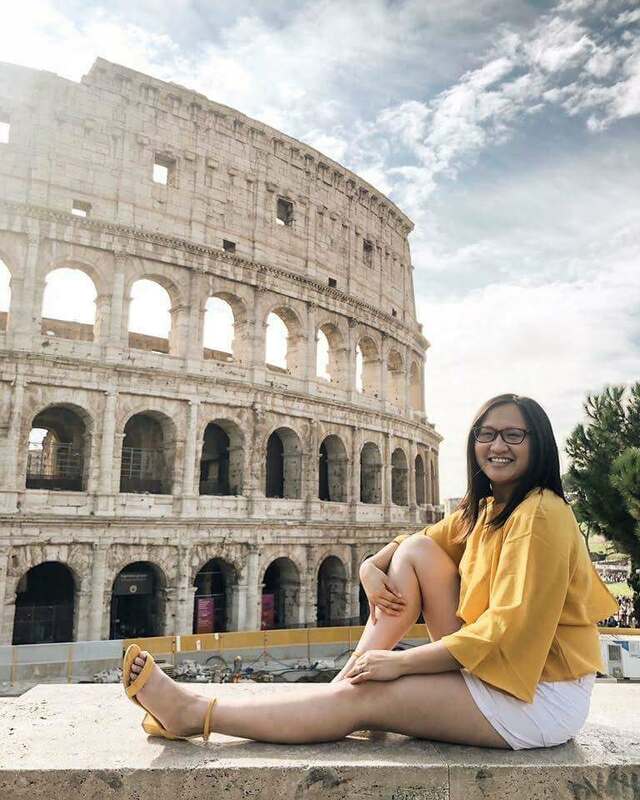 There are so many ‘bucket list’ sights to see in the Eternal City—incredible, jaw-dropping structures full of rich history and culture. We walked for the most part. Took an Uber once. And rode the train and buses too. All great ways to see the city, which at one point was the largest city in the world. We feel so lucky to have gotten a chance to visit Rome. And I hope this guide helps you on your journey too! If you need more guidance, be sure to check out Rome Capital Tourism and Italian Tourism! And if we missed doing something in Rome that you consider an absolute MUST, please let me know! !